The U.S. and the United Arab Emirates are reportedly nearing a deal to resolve a years-old dispute over alleged government subsidies to Emirates and Etihad Airways, which the major U.S. carriers claim have distorted competition, The Associated Press reported. The report said the deal will closely mirror a similar pact reached in January between the U.S. and Qatar, in which Qatar agreed to release audited financial statements for Qatar Airlines within one year "in accordance with internationally-recognised accounting standards." Within two years, the Qatari carrier would also disclose any transactions with other state-owned entities, such as caterers or other companies that support airline operations. In an open letter to U.S. president Trump earlier this month, the founder of the Business Travel Coalition (BTC), Kevin Mitchell stressed that the " U.S. Open Skies agreements with the UAE and Qatar have delivered huge benefits to U.S. consumers, aerospace manufacturers, the travel and tourism industry and the U.S. economy." "These pacts have proven to be an indispensable engine for U.S. manufacturing and tourism-related job creation and have yielded vast increases in connectivity between the U.S. and destinations that U.S. airlines don't serve. At the same time, they have enabled all-cargo carriers to establish global networks over which flow billions of dollars of exported U.S. products," Mitchell said. In the letter to Trump, Mitchell also noted that at a time when Delta Air Lines, United Airlines and American Airlines (Big Three), have been reaping record-setting profits, the U.S. carriers have been seeking "to undermine these agreements and are demanding that your Administration protect them from competition. Importantly, the Big Three have used their considerable newfound financial and political clout from industry consolidation to bully Members of Congress into supporting them by petitioning you." According to the AP report, a possible deal would see the two Emirati carriers agreeing to voluntarily open up their respective accounting books and also assert to the U.S. that they currently have no plans to add additional flights to the U.S. from Europe or other destinations outside of the UAE. 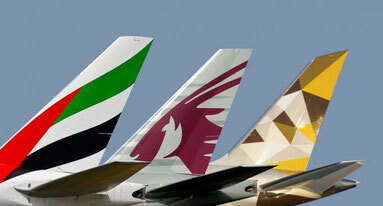 Apart from the alleged state subsidies, another major concern of the Big Three are the so-called "Fifth Freedoms" flights - routes that go from third countries, such as those in Europe, directly to the U.S. Emirates currently offers a limited number of these flights, which operate from New York-area airports to Milan or Athens without a stop in the UAE. The Big Three, with their antitrust immunised alliance partners, have been demanding that the U.S. government protect their enormous transatlantic profits from the Gulf Carriers as well as Norwegian Air UK competition. However, instead of their demand for a "freeze", the Big Three are likely to receive a side-letter which states that as of now, there are no plans to offer any more such flights. This side document is still being drafted, the AP report said, adding that although the complete deal has yet to be finalised and formally adopted, both sides have agreed to the broad outlines of the deal. It was unclear exactly when it would be completed. In a reaction the State Department said "discussions are ongoing" but declined to confirm the details of the deal.